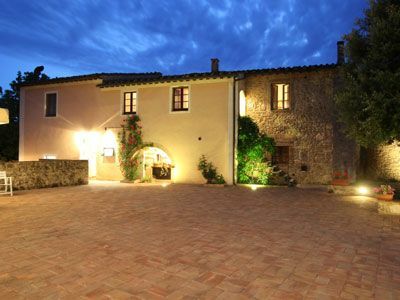 Antico Borgo San Lorenzo, purchased in 1990 by the family Bandini and restored with great care over the years, now back to its original vocation: the old agriculturla farm, the pig, the barn, the granary, the Owner House become now pleasant and elegants homes for guests. The special forniture, with antiques, terracotte floors and wood floor give the house a touch of rusticity that is combined with a harmonius atmosphere. Nine apartments are available for guests; the apartments can host from 2 to 9 peole, each apartments has a private entrance and a private outdoor green area and double room with bath. In the core of the ancient hamlet Antico Borgo San Lorenzo, you will find one of the most characteristic places of the Elsa Valley, the “Casa Bandini” restaurant. Here you will be immediately charmed by the welcoming and cozy atmosphere that will surround you. Antico Borgo San Lorenzo is an ideal place for a wedding banquet inside the cozy rooms of the restaurant "Casa Bandini" or outside in the old barnyard restored, situated in the green hills of Chianti Senese, after sipping a cocktail at the edge of our pool. Let Jacopo and Alessia will help you make your most important day, memorable for you and your friends and family, following you in approaching marriage, and in choosing the perfect menu. The apartments of the Village will be made available to your guests. Antico Borgo San Lorenzo is located in the tuscan countryside, in the are of the Chianti Senese, between hills of vineyards of Sangiovese, with gorse bushes, lavander and wild roses. In Poggibonsi there are all kind of shops and services. Poggibonsi, 5 km from the relais.